Back to the Blackfriars! What a glorious phrase. The American Shakespeare Center in Staunton, VA is one of my very favorite places to be. Their approach to Shakespeare excites me as a scholar and a theatre critic, and speaking as an audience member, shows rarely disappoint here. The Actors’ Renaissance Season is, for my money, the best time of all to visit, and so it’s no surprise that I’m back for another three-show weekend in Staunton. We’ve got The Comedy of Errors, Henry VI Part 3, and Look About You up this weekend, and I’m pleased as the proverbial punch to be reviewing all three shows. First up was The Comedy of Errors. Walking into the Blackfriars is always a bit of a thrill, but for me, the fun really started when Ben Curns entered as Egeon and took his long, expository monologue straight to the audience. YES, my original practices heart cried out, YES, I AM HOME AGAIN. I’ve seen a lot of great Shakespeare in America, but no one uses the audience with so much ease as do the actors of the ASC, and the Ren Season gets the best of the best. There’s a fantastic undercurrent to the way the actors address the audience in CoE- the Antipholuses (the ever-wonderful John Harrell twinned with a splendid straight man in Patrick Midgley) and Dromios (the clowning talents of Tyler Moss SHINE here and Gregory Jon Phelps is a worthy match for him) turn to the audience again and again in disbelief at the strange events that befall them. Addressing the audience always draws us into complicity with the events of the play, but in this CoE, I also felt for the first time CULPABILITY. These guys just kept asking for help and guidance and I just SAT THERE and watched them squirm. The undercurrent is always there, but this time around, I felt it particularly keenly. As I told my blogging compatriot later, "They kept asking for my help, AND I REFUSED IT. It's ALL MY FAULT. They looked out and shouted 'Save us!'... and I whispered 'no.'" Needless to say, I HEART IT. There are also great turns from Chris Johnston as the Courtesan and Allison Glenzer is a memorable Abbess. I should also mention Miriam Donald’s Luciana- it’s not as flashy a comic performance as others in the production, but as I watched her sweetly square Luciana converse with Sarah Fallon’s Adriana, I had one of those wonderful moments of, Why yes, that’s Luciana, right there. Those moments, where an actor pings right on to an interpretation of the character that makes such SENSE to me, always stand out. Speaking of wonderful moments, this production does a splendid job in finding its focus and turning that focus on a dime. 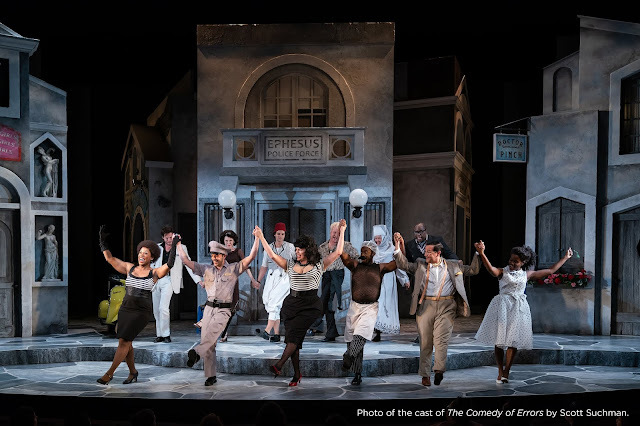 Throughout the show, we enjoy the hijinks and the physical comedy that the Dromios bring, but we all know that what we’re watching is Antipholus of Syracuse’s story, aren’t we? It’s his life that changes and we’re just waiting for all the mistakes to sort themselves out and for him to get the girl and oh yeah, rescue his father (remember him?). But as the errors unravel and join up rightly at last in a beautifully balanced stage picture, we see an awkward moment between the two Antipholuses. An aborted hug and handshake turn into a fist bump and I sat in the theatre and suddenly thought, Man. I DON’T really like these guys all that much. That Antipholus of Ephesus is kind of a jerk and really, his brother isn’t so fabulous hisownself when you get down to it. But then we’ve got the Dromios left, and all the sweetness that was lacking in the reunion of the masters is there in their servants. Suddenly, it feels like all the fun and cleverness these two have been having all afternoon earned THEM a happy ending worth more than what their “betters” received. Nail that moment, and you’ve got the whole audience on your side, and that’s exactly what the ASC has done. Nicely played. Next up: Henry VI Part 3. HOT DAMN, HOO BOY, AND HALLELUJAH. I think it’s pretty clear where this blog stands on the question of the kickassity of the Henry VIs. I just don’t understand how they earned their reputation as soggy, substandard Shakespeare when it’s patently untrue, whether on the page or in performance. Thanks to some high profile productions in recent years, the tide of public opinion may well be turning, but I’ll still need to carry the banner of the Henry VI Apologist for a while yet. In any case, the ASC’s production of Henry VI Part 3 is a fantastic example of how much actors are itching to sink their teeth into some of Shakespeare’s best roles and how audiences are likewise ready to eat up what they serve. Sarah Fallon is on FIRE as Queen Margaret in this production. She’s riveting, charismatic, and passionately driven, whether she’s confronting her husband, mocking York with the blood of his youngest son, or lamenting the death of her own child. Likewise, Ben Curns is clearly having the time of his life as Richard. I’m not sure if there’s any other Shakespearean character that draws instant fascination at the same level that Richard does- Margaret’s my girl, but all the world knows Richard III. Curns played Richard last year in Henry VI Part 2 and it’s a good bet he’ll be back for Richard III next year and I am SO DAMN EXCITED for it. Curns’s rendition of the famous soliloquy ("Why, I can smile, and murder while I smile") that ends the first half of the ASC’s production is... well, DELICIOUS. The Blackfriars resonated with the wonderful tension of an entire roomful of people hanging on to every word an actor speaks- it’s a moment that will stick with me for a long time. 3 Henry VI is filled with such showcase moments, and this production delivers them consistently, whether it’s in the violence of clashing armies or the utter quiet that surrounds a powerful speech. People come to see Richard and Margaret, but we also get Jeremy West’s splendid downfall as Richard Plantagenet (a head-turning moment for me; I’ve liked West in the past, but this made me sit up a little straighter and say DAMN) and Tyler Moss as a gloriously conflicted Warwick, trying to live so genuinely by a code of honor that it sets him apart from just about every other character on the stage. One of the things I love best about doing a weekend of shows at the Blackfriars is the repertory’s ability to let me see actors ACT, to see them at the full range of their talents. To have gone from seeing Moss’s Dromio to his Warwick in the course of one day is a rare treat. Likewise, while I hooted at Chris Johnston’s Courtesan in Comedy , I was taken aback by the menace of his Clifford. I’ve known how kickass this play is for years, but it’s a fantastic feeling to hear the audience around you stand up at the end of the evening, stretch, and start to murmur in surprised tones about how much they enjoyed the show. When it’s a production like this one, of course, you just wonder why they’re so surprised. Finally, there was Look About You, a work from an anonymous playwright of the seventeenth century that’s like a strange prequel to The Lion in Winter with a whackadoodle dash of Robin Hood thrown in for good measure. Is it a great play? Nope. But it doesn’t have to be a great play to make for a great afternoon at the theatre, a lesson which the Ren Season gets a chance to prove year after year. I love getting to see plays that I’ve only ever encountered in footnotes before, and maybe that makes me a nerd (NERD! ), but I also had a grin on my face for 2.5 hours this afternoon, so haters to the left. Here’s what I DID love about this show. Look About You is chockablock full of characters disguising themselves as each other and it gives a fantastic opportunity to sit back and embrace the absurdity and joy of theatrical conventions. When actors double a part, they come on in a different shirt and BAM- we believe that they’re someone else. In this play, John Harrel’s Skink trades cloaks and hats with Chris Johnston’s Redcap and voila- even Redcap’s father (Tyler Moss) is fooled. It’s ridiculous. It’s preposterous. IT’S BEAUTIFUL. When you add in Ben Curns’s Gloucester to the chaos, disguising himself as pretty much everyone that Skink HASN’T tried to impersonate, it just turns it up to eleven. It’s a world that also allows Patrick Midgley’s strapping Robin Hood put on Lady Marian Fauconbridge’s (Miriam Donald) dress and be wooed by a Prince Richard (Gregory Jon Phelps) who doesn’t seem to notice that she’s gained at least twelve inches in height and doubled her muscle mass. It’s not the least bit plausible, but why does it need to be? I love getting to see John Harrel take on less overtly comic roles, but by gum, if I don’t also enjoy watching him do silly walks and voices (as when Skink impersonates Prince John- my mind kept flashing to Bill, Gill, and Jill from “The Muppets Take Manhattan”). Likewise, every time Tyler Moss’s Lord Fauconbridge skittered crablike across the stage, I couldn’t stop giggling. Allison Glenzer shone both as a glitteringly menacing Queen Elinor and as a persuivant in the throes of poison (she’s always fearless in her physical clowning, and I love it). By the end of the weekend, I was in despair. How was I ever to maintain my street cred as a blogger if I’m so easily put in the thrall of the American Shakespeare Company? Then I realized that if that was my complaint, things could be going a LOT worse for me and it was better to shoulder the terrible, terrible burden of being consistently delighted by the ASC’s work and the wonderful Renaissance Season ensemble. Gentle readers, it’s a tough and thankless job, but somebody’s got to do it. If you care to join me in my predicament, get down to the Blackfriars before the end of the month. You’re welcome.